All links forward to French-language pages unless otherwise noted. 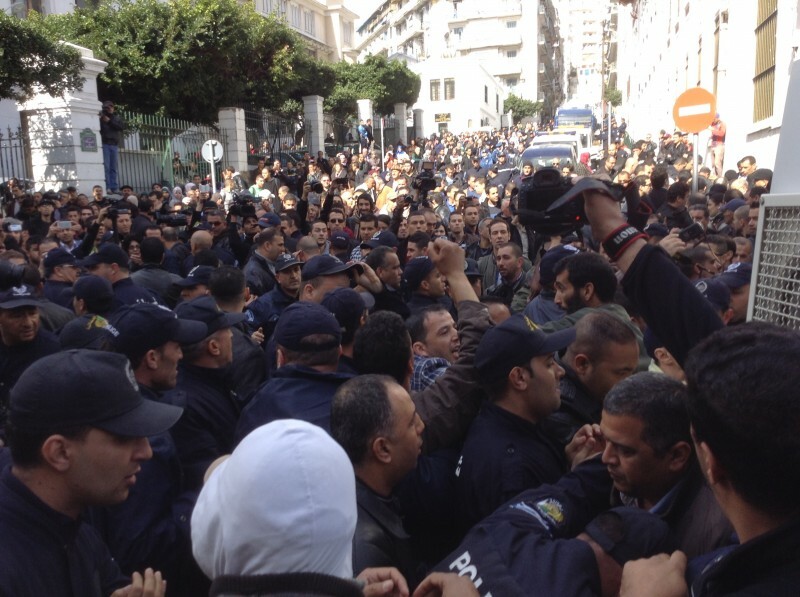 Today in Algeria, belonging to the opposition seems to carry more risk than ever before. Smear campaigns, slander, vilification and even death threats are a regular part of online life. Offline, intimidation, police crackdowns, breaches of privacy and political pressure are commonplace. Since presidential elections held on April 17, 2014, the Algerian regime has stepped up its repression of opposition groups with threats against those who opposed a fourth term for the 77-year-old ailing incumbent President Abdelaziz Bouteflika. An amendment to the country's constitution allowed Bouteflika, who has been in power since 1999, to run for a fourth term. Throughout the electoral campaign that began in late March, protesters and cyber-activists advocating for democratic elections were subjected to defamation and police aggression. The intimidation did not end with Bouteflika's landslide reelection, which was marred by allegations of fraud [en]. The Barakat! Mouvement (Enough is Enough Movement, in English), one of the major organizations of dissent in Algeria, was among the first targets. Its rallies were broken up with a heavy hand by police, and some members were reportedly beaten or arrested without reason. The Algerian regime and its media apparatus targeted important leaders of the movement by making personal information of theirs public. Les pages Facebook créées à cet effet essaient de convaincre les Facebookers de ne pas suivre les boycotteurs et ceux qui appellent à des marches contre le quatrième mandat, notamment le mouvement Barakat. Le mouvement Barakat est ouvertement diabolisé. Sur une des pages, des photos des capitales touchées par le Printemps arabe sont publiées. Le groupe incite les fans à prendre leurs précautions contre « les ennemis de l’Algérie ». Ennahar TV and Numidia News, two recently established TV channels known for their openly pro-regime stances, launched a media campaign against the movement. In one report by Numidia News, which is owned by a business tycoon close to the president, Barakat supporters were accused of treason, described as enemies of Algeria, and even portrayed as ”dangerous” terrorists. Reports depicted the movement as a secret initiative of western countries. Bouteflika often referrs to their actions as undertaken by “the foreign hand”. Les services des Renseignements généraux (RG) et du Département de renseignements et de sécurité (DRS) en Kabylie, ont acquis un important lot de matériel sophistiqué pour bien mener leur mission de répression. Rien n’est laissé au hasard. La vie professionnel et intime des militants de la cause démocratique est par ailleurs passée au peigne fin. Secret Services (RG) and the Department of Intelligence and Security (DRS) in Kabylia acquired a large batch of sophisticated equipment to properly carry out monitoring and repression [online]. Nothing was left to chance. The professional and personal life of activists for democracy are monitored very closely. Screen shots of the Facebook page Barakat L'escroquerie. 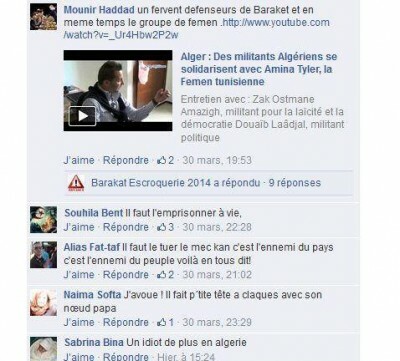 One comment says: “il faut le tuer le mec kan c'est l'ennemi du pays” (We need to kill this guy. He is the enemy of the nation). The strategy recalls practices of the government during Algeria's civil war in the 1990s that devastated the country for more than a decade. Back then, opponents and intellectuals were murdered after their personal info was made available in the public arena. Such was the case of Sidali Ben Mechiche, a journalist killed on October 10, 1988, and Djamel-Eddine Fahassi, killed on March 8, 1995. These threats have sparked panic and anger among the opposition. Some, like journalist Idir Tazerout, have decided to take legal action, although the independence of the country's justice system isn't reliable. Others have preferred to stay quiet for a while in order to protect their families. And then, there are those who stand firm for a free and democratic Algeria.